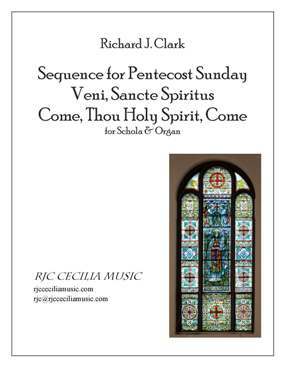 ENI, SANCTE SPIRITUS, the Sequence for Pentecost Sunday is one of the great jewels of the Roman Rite. The Gregorian Chant is exquisite. The text alone is a treasure—short, simple, profound, and transcendent. What a gem for the Church! What a gem for our sacred Liturgy! COMPOSED THIS SETTING APPROXIMATELY TWENTY years ago or more, perhaps in 1992. I’m not sure. I wrote the piece for tenor Mark Donohoe, a superlative cantor who possesses clarity of diction, humility, and prayerful expression, (and a heart of gold.) Also effective for a schola, this setting has been unusually popular, hopefully reverent, and somewhat worthy of the extraordinary sacred text.